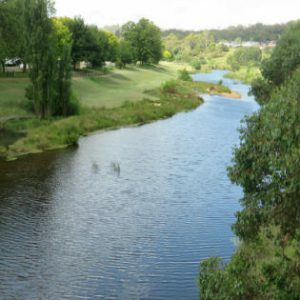 In the language of the Ngarigo people, Bombala means where the waters meet, referring to the confluence of the Bombala and Coolumbooka Rivers near the present town. The Bombala district was first settled by Europeans in 1833, becoming a township in 1851. It was the time of steamships plying up and down the coast between Sydney and coastal towns and in 1850 a regular mail service by horse and coach ran between Eden and Bombala. 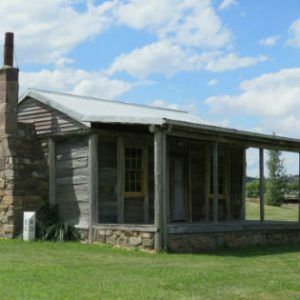 By 1856, Bombala’s population was nearly twice that of Cooma and a number of substantial public and commercial buildings had been constructed. The Bombala Times newspaper commenced in 1863 and the Bombala Public School was established as a one-teacher school. The annual Bombala Show was instituted in 1875 and the Bombala Hospital completed by 1885. In 1887, Bombala Racecourse was established and gold was found. The first priest to visit Bombala was Fr McGrath, priest of Bungonia near Goulburn, who visited families at Bombala, Delegate, and Nimmitabel to baptise children in 1841. From that time, priests stationed in Queanbeyan made regular visitation on horseback via Braidwood, along the coastal road to Eden, up the mountain to Bombala and Cooma. In 1856, the Monaro parochial district attained its independence, with the first priest, Fr Charles Quinn, stationed at Cooma. St Mary’s, the first Cat holic church in Bombala, was built in 1867 and replaced in 1942. Father J. J. Carroll, who served at Bombala in the 1870s, was removed in February 1878, despite his opposition to his removal. He was succeeded by Fr Hayes who subsequently moved to Wollongong. In 1883, Fr James Fleming came from St Mary’s Cathedral to Bombala as parish priest. He wanted to set up a school, while at the same time raising funds to build a presbytery. Why did the Sisters of Charity go to Bombala? There is little evidence as to why four Sisters of Charity from St Vincent’s Convent, Potts Point, arrived in Bombala on February 11, 1885, but we do know the how – they travelled by special horse coach from Bega. They would have sailed on a steamship from Sydney probably to the port of Tathra. It is likely that the Sisters would have stayed at the Nazaretto Convent at Bega (where Sisters of Charity arrived in January 1884) prior to travelling from Bega to Bombala by horse and coach. We do know that the Rectress of Bombala, Sr Mary Vincent Carroll, was the sibling of former parish priest, Fr J. J. Carroll who served Bombala in the 1870s. Sr Mary Vincent had been the first Rectress at St Mary’s Convent, Liverpool in 1878 and after service at Bombala, became Rectress at Nazaretto Convent, Bega after her niece, Sr M Aquin Bourke, left Bega in early 1888. In 1884, together with a parish committee, Fr Fleming purchased a building for use as a school. It was situated on the corner of Mahratta and Stephen Streets, on the Sydney road coming into Bombala, opposite the Bombala River. The school building, formerly an old slab timber hotel, was on a corner with three frontages, had an extensive yard and an orchard on an acre of ground. Funds were raised locally so that renovations could be undertaken to convert it for school purposes. The property was purchased for £500 from Mrs Mary Hughina Chopin, the widow of the late Dr Charles M. Chopin (1824-1871), a general medical practitioner of Bombala. Next to the former slab timber hotel was a brick residence, also purchased from Mrs Chopin, which the Sisters of Charity converted for use as All Saints’ Convent. Seventy children were enrolled on the first day of school, Monday, February 16, 1885, 61 of whom came from Bombala Public School. Two weeks later, eighty children had been enrolled. Sr Mary Vincent’s niece, Sr Mary Michael Bourke, was one of the other Sisters. She had taken her final vows on January 8. 1885, about a month prior to arriving in Bombala. The names of the other two Sisters who were sent to Bombala are not recorded. An advertisement in March, 1885 in the local press announced that a high school in connection with the convent school was planned to be opened in a few weeks. The school was planned for “young ladies” as boarders, with French, music and astronomy to be taught. By March 7, 1885, three boarders had commenced and the Sydney newspapers could report in June 1885 that the school had opened “about a month ago.” The next press report described the first annual exhibition and distribution of prizes for All Saints High School, held on December 16, 1885, followed on December 18 by the primary school’s annual exhibition and distribution of prizes. The Sisters also visited the sick in the local community. Fundraising for the convent and the school proceeded not only in Bombala but also in Nimmitabel, about 60 kilometres north of Bombala, as evidenced by “a Grand Bazaar in aid of All Saints Convent, Bombala” held in Silk’s Royal Hotel, Nimmitabel on St Patrick’s Day, March 17, 1886. In early 1887, a well-attended “plain and fancy dress ball” was held in Bombala in aid of the convent. By then there were more than 100 students. No further reports of the Sisters of Charity in Bombala were located and we do not know why they left. The convent and school remained until 1918, before moving to new convent and school buildings in Queen Street, Bombala. Bombala had variable and extreme weather during the time the Sisters were in residence there. Could this have been a factor in the Sisters leaving Bombala? We might never know. Bombala experienced a hot and dry start in 1885, with dust storms and temperatures reaching 39 deg C (102 deg Fahrenheit) in the shade. The year that followed was characterised by cold weather, heavy frosts followed by earthquakes and snow, drought, downpours of rain and much sickness in the community. In the winter of 1886, it was so cold that locals were able to ice skate on the frozen Bombala River. In January 1887, hot days up to 39.5 deg C (103 degrees Fahrenheit) and cold nights with severe frost were experienced and the mail service between Bungendore and Bombala was interrupted by a flood. 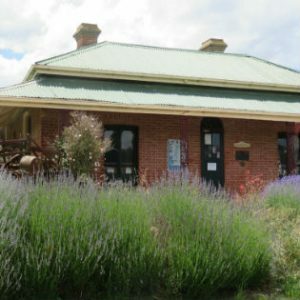 – A visit on annual holidays to Bombala in December 2017, writes Congregational Archives Manager, Janet Howse, was precipitated by the lack of information about the Sisters of Bombala in the mid-1880s. The visit and subsequent research resulted in this article. 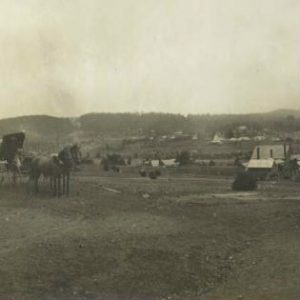 Bombala in 1902, taken by E T Luke. Courtesy of the National Library of Australia.